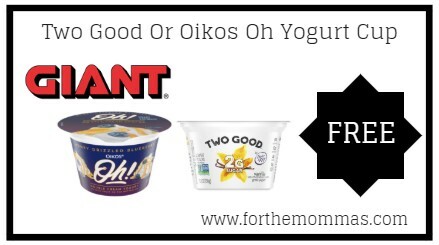 Giant: FREE Two Good Or Oikos Oh Yogurt Cup Thru 2/21! You can score Two Good Or Oikos Oh Yogurt for Free with a coupon. This coupon is good for One (1) Free Two Good or Oikos Oh! 5.3oz yogurt. You will need to load the digital coupon by 2/8 and redeem by 2/21.